Tyler Sargent was out for a nighttime run in Prospect Park two weeks ago, at around 9 p.m., when he heard some familiar music in the distance. 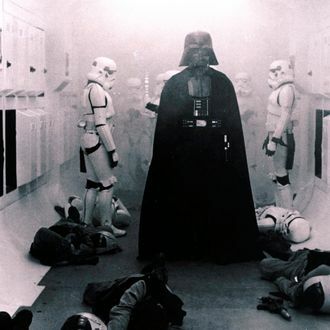 It was the “Imperial March” — also known as Darth Vader’s theme song — and it was growing louder. That’s when an NYPD cruiser drove by him, “blasting” the song “at a volume that surely must have drowned out any emergencies being dispatched from the Death Star,” Sargent (who happens to be the former bassist for the band Clap Yours Hands Say Yeah) tells Daily Intelligencer. “The cops were laughing like stoned high-school kids as they drove by,” he added. It turns out this wasn’t an isolated incident. On March 29, also just around 9 p.m., Scott Rosann was walking his dog on Fifth Avenue in Park Slope. The TV editor tells us he heard the “Imperial March” and thought to himself, “Huh. You don’t hear THAT coming out of car windows in this neighborhood very often.” He was surprised to discover that the car in question was a police cruiser, its emergency lights bouncing off the nearby buildings as it headed away from him on 12th Street. It’s not clear whether the incidents are the work of a single pair of cops or if the practice is more widespread. We reached out to the NYPD for comment and never heard back. But maybe that’s the point — taking a song that was once used as a caustic commentary on police aggression and embracing it, with pride, as their own.